A day of paddleboarding couldn't get any better: Clear skies, down winds, and a surprise visit from a friendly pod of dolphins. 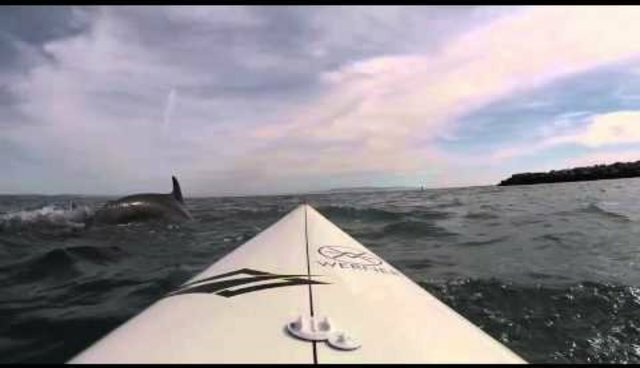 Earlier this week off the coast of San Luis Obispo, Vincent Shay and his friend Scott Smith were paddling from Avila Beach to Shell Beach, when their activity caught the attention of the curious dolphins. The owner of a local surf shop, Avila Beach Paddlesports, Shay had a GoPro camera mounted on his SUP (Stand-Up Paddleboard) and filmed the whole encounter.